Established in 1971, Lakehill Preparatory School is an academic community dedicated to the whole student. That means combining a robust, college preparatory curriculum with opportunities for personal growth, individual enrichment, and community engagement. Small class sizes ensure a supportive learning environment and personal attention. From kindergarten through high school, every Lakehill student is encouraged to strive, challenged to succeed, and inspired to excel. Finding the right environment for your child’s education makes a world of difference. At Lakehill, you’ll find an environment that nurtures intellectual curiosity, stimulates personal growth, and encourages critical thinking and innovation. Lakehill is committed to providing students from kindergarten through high school with a unique and high-quality education and to helping young people develop – not only as students, but also as well-rounded individuals. Choosing to enroll their children at Lakehill is often the last educational decision parents need to make until college. By building a solid academic foundation, Lakehill develops confident individuals prepared to succeed wherever their choices lead them. 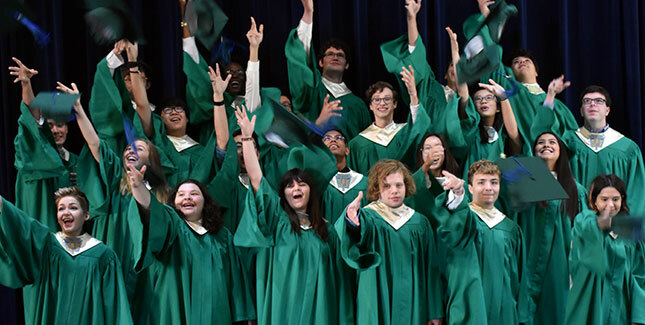 Lakehill students all go on to pursue education at a higher level, and are accepted into Ivy League schools, top research universities, liberal arts colleges, renowned art institutions, and international universities. What is most important about our students’ matriculation however, is the process of pairing the student with the right school. Through an extremely successful college counseling program, we work together with every family, discussing each student’s dreams, abilities, needs, and interests when choosing a school. Collectively, the Class of 2018 earned over $2,600,000 in academic scholarships, an average of $118,000 per student.